Stress Management In Research Projects ŞTEFAN VELICU1, Fl. VELICU2, ALEXANDRU VELICU3, M. GIURGIU2 1, 3 Politehnica University of Bucharest, 2 190 School ”Marcela Penes” 1,3 313 Spl.IndependenŃei, Bucharest, 216, Nitu Vasile, Bucharest 1,2,3 ROMANIA [email protected] Abstract: - The paper analysis how stress occurs in research projects proposing a set of recommendations on methods and techniques that can be used to prevent and/or eliminate negative stress. Words and References corresponding author: Prof.dr.eng. Stefan Velicu - University Politehnica of Bucharest: [email protected] Key-Words: - management, projects, research, stress. proposes methods and techniques to cope with negative stress. Traditional project management relied on an approach based on linear cause-effect relationships. Modern project management offers a perspective and a systems approach whereby projects are seen as a "whole" complex unit, characterized in particular by a two-way relationship. This means that instead of being considered the "input" problems (input actions) and "output" problems (output actions), it should be seen as coming from the entire set of information reception and response, its control and process control, feedbacks and assessment. Through this broad perspective more accurate and complex results are obtained than traditional methods, especially if changing and adapting to environmental variables is seen as a continuous process and not as a creator and uncontrollable risk factor. In recent decades the field has intensified research on stress. What is stress, how does it appear, what can be done when the organism is filled and no longer can deal with the situation, these are fundamental questions the researchers sought to answer . According to R. Lazarus, stress occurs when an individual perceives the external environmental demands as beyond his power. Later, along with Lazarus, S. Folkman proposes in one of their works, the idea that stress can be seen as the result of "imbalance between demands and resources" or as a result of "pressure that exceeds the power supposed to be held". that arise can generate a state of acute stress which may manifest itself through lower productivity at work, loss of attention etc. people affected. But researchers found that the best way to prevent stress on the individual is learning a model of proactive attitudes and behavior, prevention of stress or cope with stress during childhood. Regarding stress in projects, most do not list specific differences between key processes of project management and stress management. Because stress has a major impact on the successful delivery of project results to the beneficiary, the stress analysis in projects should be considered paramount, as it is manifested in the project team. As a result, due to the stress appearance at physical or psychological level among project team members, there may appear unexpected side effects that may not be anticipated, but may affect activities. It is vital that the project manager focuses on direct contact and manage tensions, conflicts and stress by various methods, including but not limited to: improving emotional intelligence competencies, time management and promotion of change, stimulating the respect for self and others, maintaining positive interpersonal relationships between team members through open and effective communication and maintaining motivation through appropriate rewards. Systematic and controlled stress management minimizes negative effects on individual level, which will automatically lead to growth and positive value results, labor efficiency, increase productivity and quality in projects. emotional intelligence and stress levels . The proportionality between stress levels decrease with the increasing level of EI can be explained by the fact that EI is responsible for evaluating and controlling emotions over others. Research has shown that two thirds of the problems related to stress arise from abusive, poor or limited relationships with others . EI is a component of the personality that regulates and manages stress by neutralizing its effects. Emotional intelligence is responsible for developing the potential of happiness, empathy, trust etc. And can combat the demoralizing effects of stress, such as isolation, loss of motivation, depression. Regarding the project team research has shown that the link between members EQ and positive results in their work is more powerful . Improper management of stress mainly by the project director, but also by all team members will lead to disease and illness, lower efficiency and quality and will be the main reason for absenteeism at work or refusal to work on the same team . By contrast, employees who show a high EQ are more likely to get the top hierarchy of organizations and have better results in terms of performance and quality of work. Improving, Proceeding of 6th WSEAS International CONFERENCE ON ENGINEERING EDUCATION (EE'09), 2009, pp. 112. 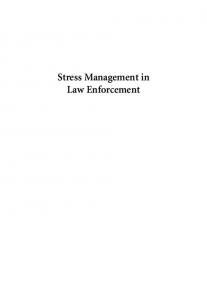 Report "Stress Management In Research Projects"